Taekwondo is the most popular martial art in the world! "TaeKwonDo, the "Way of the Hand and the Foot," is a Korean martial art which traces its roots through the centuries to the ancient fighting arts of the Korean peninsula. Today, TaeKwonDo is the world's most widely practiced martial art, with over 20 million practitioners worldwide. ART :: TaeKwonDo is practiced for the power, grace and beauty of its numerous techniques, whether it be in the practice of the individual techniques or in the practice of synchronized techniques called "poomse" or "hyung" (forms). PHILOSOPHY :: TaeKwonDo was founded on an ancient code of model citizenship espoused by the earliest practitioners of TaeKwonDo: loyalty to country; filial, piety, honor and integrity, courage in battle and justice in the use of force. Practitioners of TaeKwonDo today strive for these same ideals. Through rigorous physical exertion, the practitioner strives to achieve harmony of mind and body, and indomitable strength of spirit. 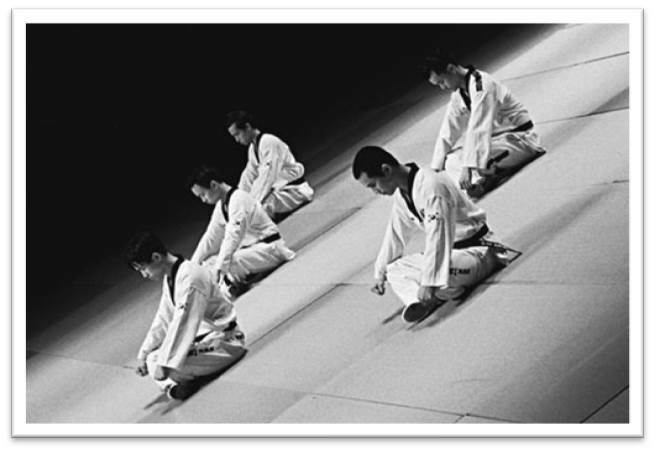 EXERCISE :: Tae Kwon Do training incorporates extensive stretching and constant aerobic exertion. The results are increased aerobic capacity, strength and awareness of one's body. SELF-DEFENSE :: Tae Kwon Do is a complete system of unarmed combat for self-defense. Tae Kwon Do is especially recognized as the martial art with the most highly developed arsenal of kicking techniques, techniques which range from the simple to the spectacular. TaeKwonDo helps students develop improved awareness, confidence, focus, discipline, memory, and respect. Chang's TaeKwonDo in Buffalo Grove has made it easy to get started. We offer a trial program which gives new students the opportunity to try TaeKwonDo, without obligation. During the trial period new students will participate in a class with people of similar ability. The trial classes also allow parents and/or students to talk with our instructors about the many benefits TaeKwonDo offers. There is no obligation at all after the trial program. At Chang’s TaeKwonDo Academy, we teach the ancient Korean Martial Art known as Tae Kwon Do. Our school is led by Master Instructor LEE, a student himself turned Master, determined to pay forward the benefits he’s obtained to others. COPYRIGHT Changs Taekwondo Academy in Buffalo Grove. 1998. ALL RIGHTS RESERVED.